Let customers text you from Instagram! You know that lots of your potential and existing customers spend hours on Instagram every day. But did you know they can now text you directly from Instagram? Instagram lets you list a text-only number on your account, making it easier for potential customers who discover you on Instagram to engage with you. 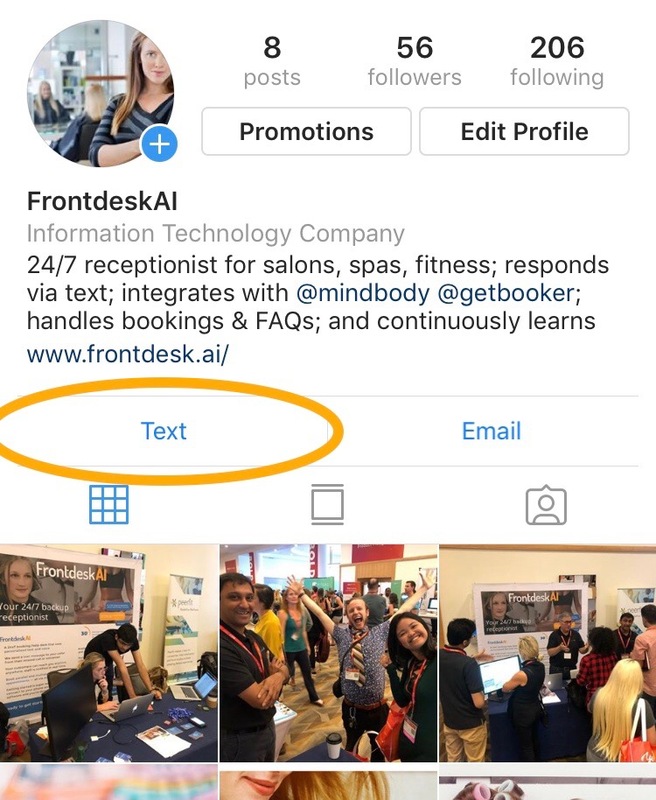 Make your business accessible 24/7 on Instagram by plugging in your FrontdeskAI text-only number. You can find your text-only number by logging into your account at https://accounts.frontdesk.ai/#/ and going to the “Setup” tab. How do you add your text-only number to Instagram? Click Done and then Save and you’re all set! More of a visual learner? Can Artificial Intelligence Replace Spa Receptionists? Ever wonder how many calls salons and spas miss? Want to stay up-to-date on Frontdesk AI and AI technology? Sign up for our newsletter.